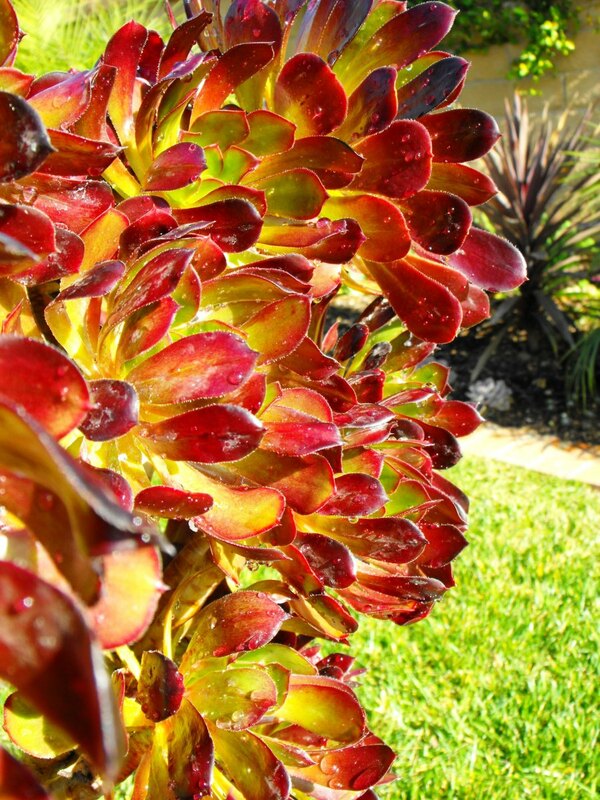 Aeonium arboreum 'Sunburst' is a striking succulent plant to use as a mass planting for big impact and bright color. The plant reaches 30 inches high and has platter sized rosettes that can be 10 inches across. 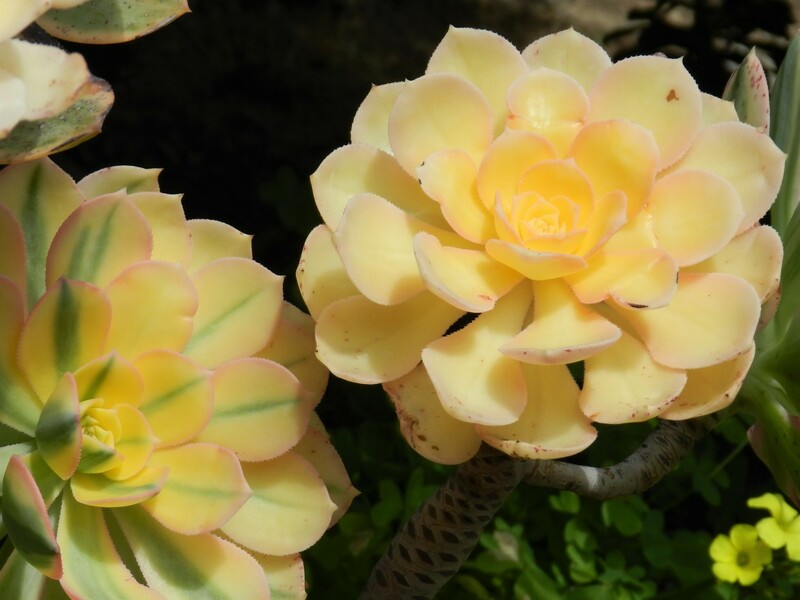 The color is light yellow with green variegation down the center of each leaf. With the right amount of sun the rosettes blush with pink around the edges. The rosettes sit atop long curved half inch thick stems of a neutral gray. Plant them together and the various sizes, rosette clusters and single rosettes appear to be bursting. 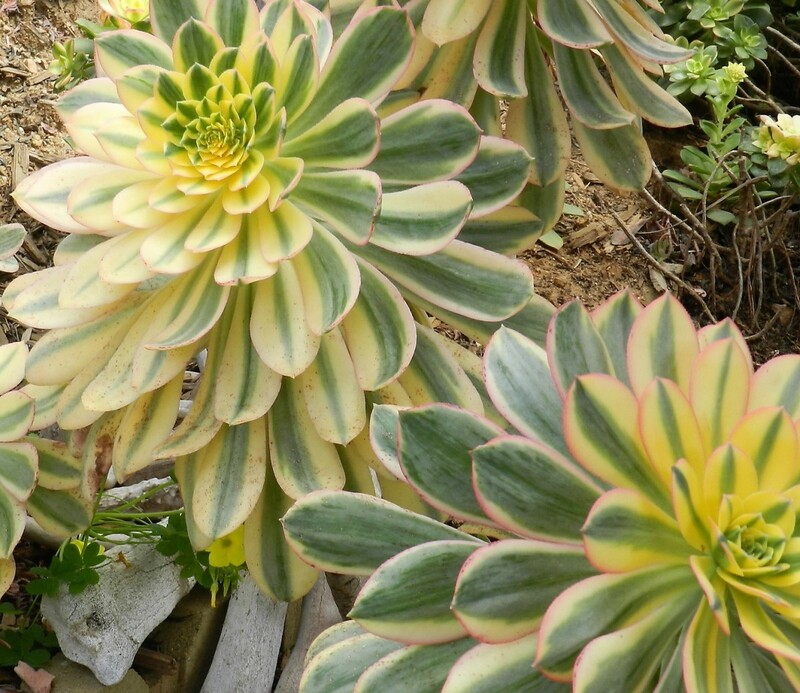 I will tell you what you will need to get your aeonium Sunburst growing like a riot in your yard. Want to go slow and not spend a lot of money? 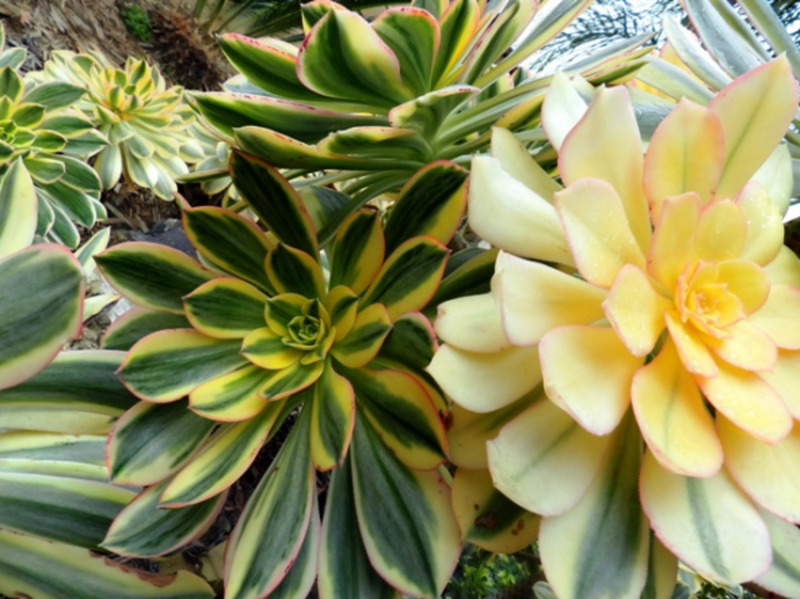 Buy one Sunburst succulent plant. The area above started as one plant. It has taken 6 years to propagate a 4 square foot area. Three plants would be a good start if you prefer more to look at in the beginning. Later, at the established stage there will be plenty to throw away. This year the mass planting was extend further and mixed with aeonium decorum Kiwi. Breaking rosettes off the top of tall mature stems and replanting at random distances produced this bed of color. By spring the mass planting was in gorgeous display. The patch is eye level on a slope and offers stunning beauty for the price of one plant and a little waiting. During California's hot summers water your plants once a week. They do best with partial shade for half the day. Hot sun will burn the leaves and turn the edges brown, but the ground can be dry for 5-7 days. A freeze will make the plant's leaves wilt and then dry up. As tall stems break or topple over replant in the immediate area to maintain the planting. At the top of this photo are the aeoneium decorum Kiwi that are mixed with the Sunburst. The Kiwi has a far smaller rosette. In spring the Kiwi's bright red tipped edges are striking. 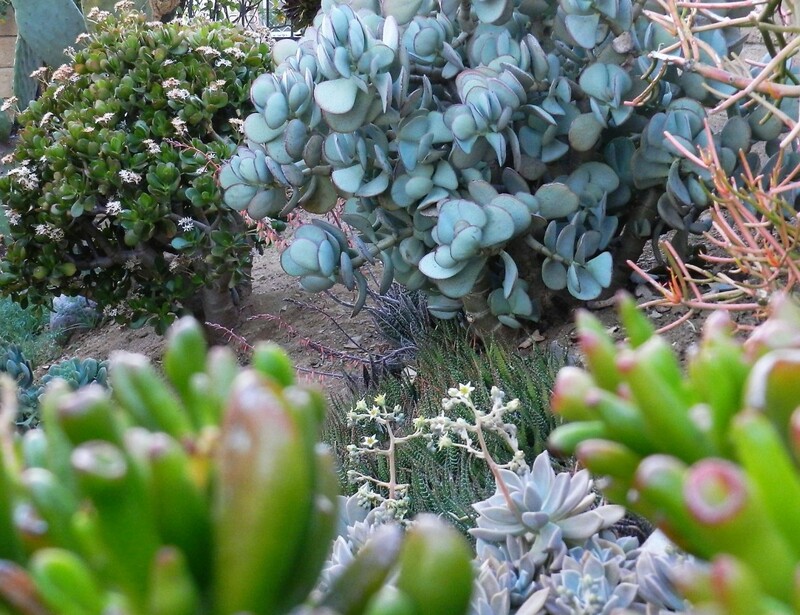 In Southern California the best time to expand your succulent garden is after the Holidays when it is cool and we are getting our seasonal rain. When spring arrives your work will burst with color and variety. I have seen the Sunburst rosettes in all yellow and many variations of green variegation. The plant is pretty. 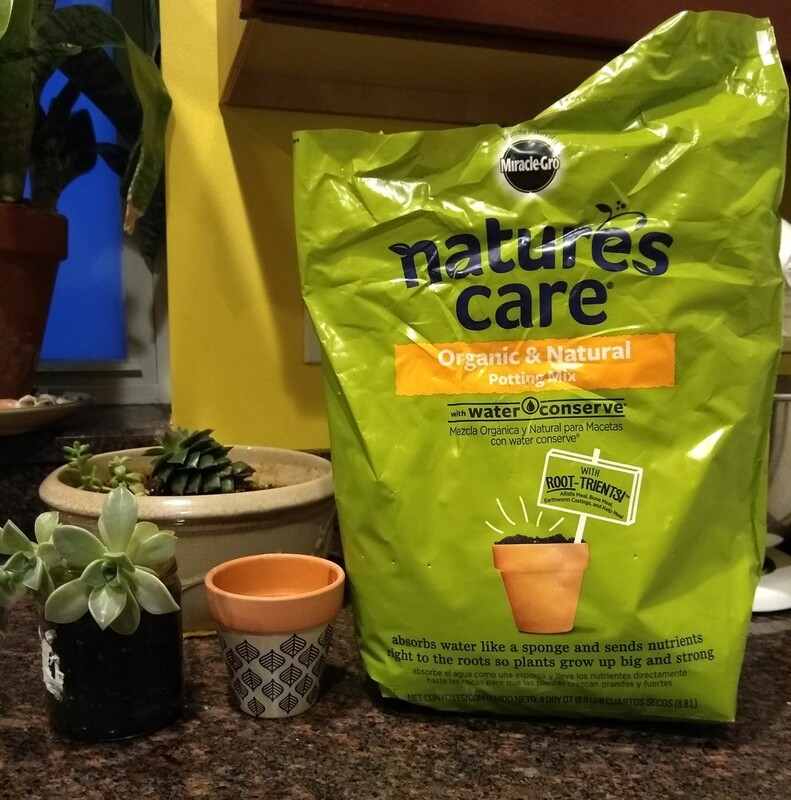 Easy to grow in pots for patios and apartment balconies. 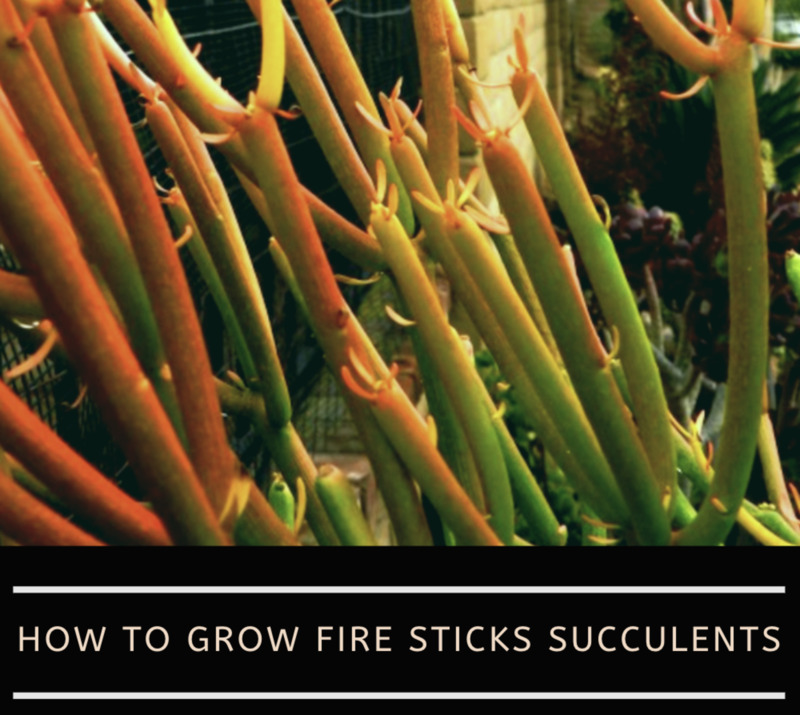 When propagating allow the end of the stem to dry out for a day or two. Also, cuttings can be put directly into soil that will be dry for a couple of days. Sunburst does well in our clay soil and the clippings do well in my mother's very sandy soil, as well. The plant will last two to three years and topple over. Break the long stem off and replant to maintain full color and dense growth in the area. 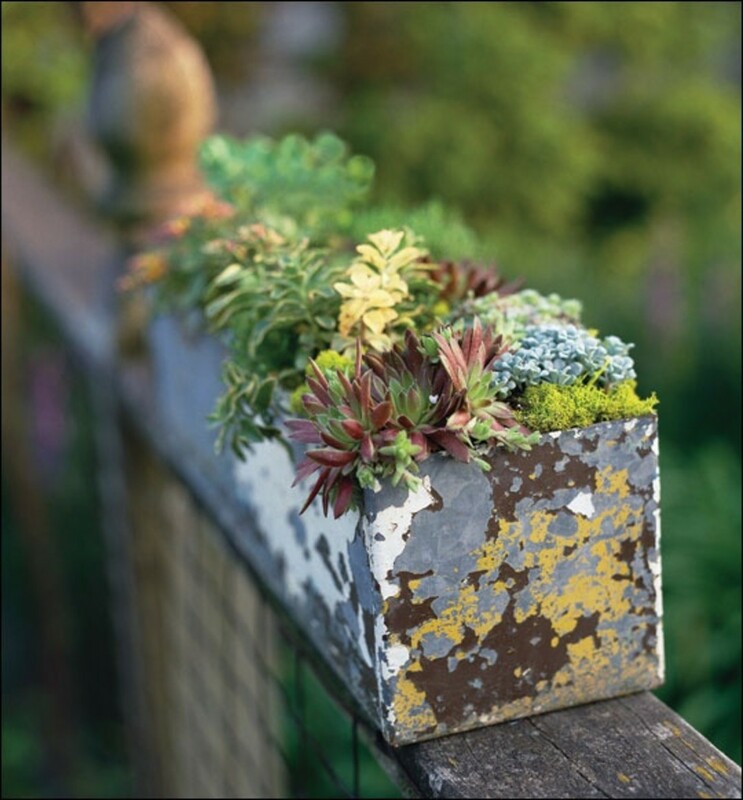 Do you have a succulent garden? 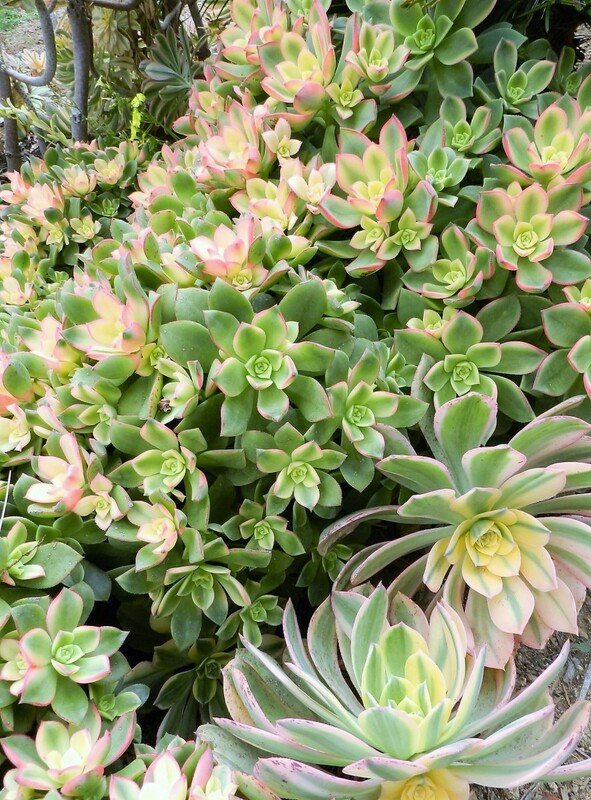 Color variety with your Sunburst aeonium. 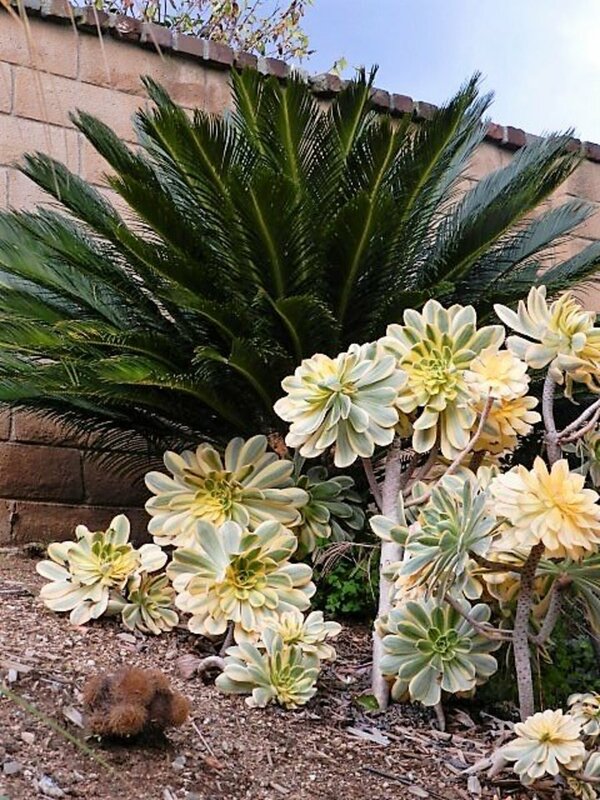 How can I keep the leaves of my Aeonium Arboreum Sunburst from drying out? The leaves will burn in full hot sun over 90 degrees. Also, the bottom leaves naturally dry up and fall off as new growth is added to the top. 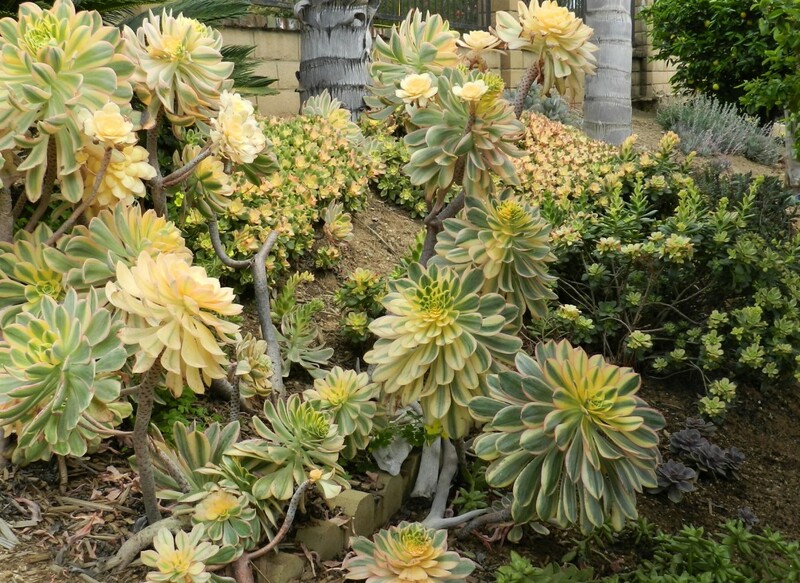 You will get dry leaf litter at the base of all aeoniums, as well as, the sunbursts. Do sunburst succulents need a lot of room for rooting? No. Sunbursts have a sallow root system and may even topple over if allowed to get too top heavy. Pull tall plants up and clear away old roots. Break off the tops, let ends harden for a day and replant. The plants do well in pots and for landscaping. I'm from south Africa and would love to start collecting succulents. Can you send me clippings and leaves of different varieties..
That succulent sunburst is a winner for me! What a lovely plant that I do need to add to my collection of plant beauties. I have seen this succulent plant in a garden, reminds me of the cactus, they make the garden look so colorful. I plant my succulents in a hypertufta pot. Sometimes in the Southeast USA, there will be a surprise freeze and I hate to loose a plant! I love them all. My succulent garden is hit and miss, but I'm trading starters with a couple of friends now. It's fun to introduce a new member to our succulent family. The Aeonium Arboreum is next! 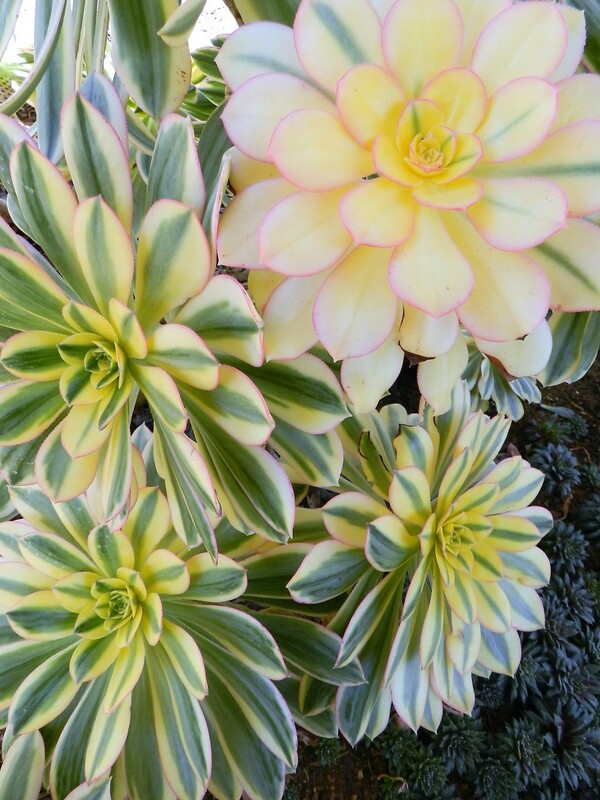 I like the variegated foliage of the aeonium arboreum. I've added several freeze-resistant varieties of succulents to a rock garden, and I also grow several other varieties in containers. During the summer, I move the pots out to the deck where they get lots of sun. As the cold weather approaches, I mover them to a sunny area for the winter. I've bought cacti so that I could take photos of their flowers. These are amazing plants with unique beauty. I don't have a succulent garden, but I think I need to make room this spring for one! These are beautiful. Too bad I don;'t think they would survive the winter here in Colorado. I have one on my back porch that my son picked out as a "treat" in Lowe's for good behavior! I don't even know what it's called, though! He loves showing people his plant, though. I was very interested in growing aeonium arboreum and thanks for the tips. I've always admired the Succulents, need to plant some. Such a beautiful plant. I envy your climate that allows you to plant outside. These look beautiful. I have a few hens and chicks, but they are small and not as showy as these.